Sodium Lauryl Ether Sulfate (SLES) Market size was recorded at over USD 1 billion in 2015 growing at a CAGR above 5%. Growing awareness regarding cleanliness and hygiene all over the world will likely bolster the global sodium lauryl ether sulfate (SLES), also known as sodium laureth sulfate, market in the coming years, which is an anionic surfactant popularly used in detergents. Several government initiatives to clean public infrastructures such as railway stations, airports, etc. 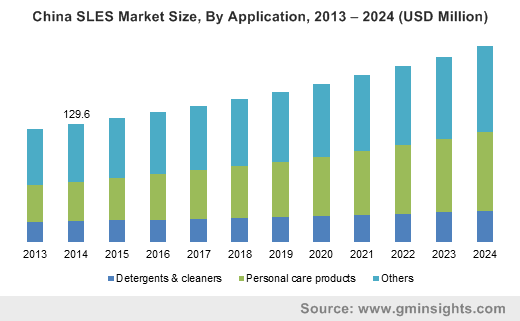 and increasing household detergents usage owing to escalating number of residential projects all over the globe will also augment the global SLES market growth. Global demand for household detergents was beyond 30 million tons in 2015 and will accelerate at over 5% CAGR in the forecast spell. Global SLES market growth may be hindered by side effects involved with the product use. Sodium lauryl ether sulfate is known to be a skin, eye, and lung irritant and may contain carcinogenic substances such as 1,4-dioxane due to the manufacturing process. Other harmful by-products of the manufacturing process may include ethylene oxide, which too is carcinogenic in nature, according to the International Agency for Research on Cancer. U.S. FDA and the EPA monitor the product usage in personal care products and cleaners respectively, and this may restrain the SLES market in the coming years. Sodium lauryl ether sulfate or sodium laureth sulfate (SLES) market applications are broadly categorized into detergents & cleaners, and personal care products apart from other uses such as medical, antimicrobial, and agricultural chemicals. Detergents & cleaners are the major application sector and generated more than USD 450 million for the overall SLES market share in 2015. Sodium laureth sulfate is an anionic surfactant with a strong amphiphilic base, making it compatible with both fat and water. The product is easily available and is a formidable stain remover, making it an accepted ingredient among detergent manufacturers. Personal care products application segment accounted for more than a quarter of the global SLES market and it includes consumer products such as creams, lotions, soaps, shampoos, body washes, facial cleansers, toothpastes, etc. Superior foaming and lathering properties of the product, due to which it wets the body surface, emulsifies the oil, and solubilizes soil, will have a positive influence on the global SLES market in the coming years. Malevolent impact of the product on human health may pose certain restraints on the sodium lauryl ether sulfate market. In 2015, Europe SLES market was worth more than USD 250 million and it will likely flourish at more than 4.5% CAGR in the coming years. High living standards in the West European countries and consciousness about personal care and cleanliness will be the major drivers of the regional market. Europe SLES market share for personal care products generated over USD 100 million in 2015. The joining of the former communist nations in the European Union marked a significant industrial shift towards the eastern Europe, driving the demand for industrial detergents and cleaners in the region. Asia Pacific accounted for over a third of the global SLES market in 2015 and will witness growth by more than 5% CAGR in the next few years. Emerging economies of China, India, and Japan will catalyze the overall sodium lauryl ether sulfate market growth. Enhancing lifestyle and increasing purchase parity of the population along with increasing awareness about personal and institutional cleanliness will signify the overall SLES market in the coming years. Moreover, increasing urbanization and industrialization in the region will also augment the demand for detergents and cleaners. SLES market is fragmented with the presence of several multinational giants in the competitive landscape. Key product manufacturers include Croda International, Evonik Industries, Clariant Corporation, Stepan Company, BASF, Huntsman Corporation, Solvay, The Dow Chemical Company, Kao Corporation, Galaxy Surfactants, Godrej Industries, Ho Tung Chemical, Taiwan NJC Corporation, Ultra Group, and Zhejiang Zanyu Technology. SLES market participants bank on extensive research & development programs and business partnerships to expand their product portfolio as well as to increase their production capacities in order to maintain their market positions. For instance, BASF opened a new R&D center in India and collaborated with several Asian universities to strengthen their focus on the emerging market. Stepan Company, in March 2014, established a R&D center in Brazil to fortify their surfactants business. SLES market is majorly driven by the increasing consumer awareness about personal hygiene and cleanliness. Growing commercialization of personal care products such as shampoos, soaps, body & face cleansers, etc. also has a positive impact on the global SLES market. Moreover, health benefits of residential as well as institutional cleanliness will also boost the market demand of the anionic surfactant in the coming years. Health hazards associated with sodium lauryl ether sulfate may lead to product substitution by organic and bio-based ingredients in the developed nations, but its easy and economical availability and good foaming properties make it a lucrative additive for detergents and personal care products in the emerging regions.